I love receiving surprises in the mail-- you know, "happy mail" and I am not talking about finally receiving my online orders! Ha! Just those random letters or boxes that show up unexpectedly; those are the best. Our latest way to make spelling fun was made from materials that came from some "happy mail." We received some goodies from CraftProjectIdeas.com and my kiddos spent that afternoon using a variety of materials from our surprise box creating all sorts of things. After finally getting a chance to dig through the box of craft goodies myself, I set aside some colorful craft sticks to use in this easy spelling activity. I must have had colors on my mind after reading two super cute color themed books-- Elmer and Bear Sees Colors because I set up a simple Clip and Spell activity focusing on color words. 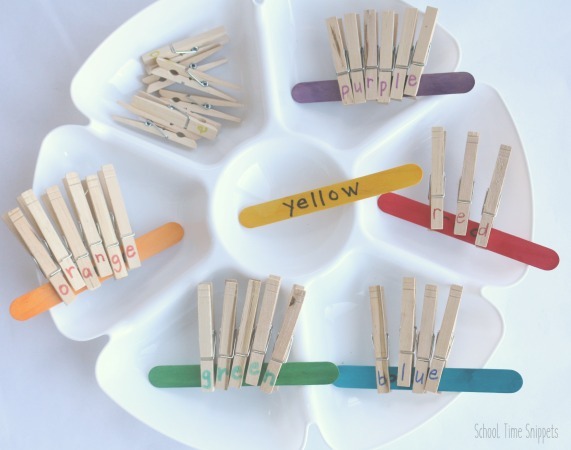 Prep the activity by writing a color word on each colored popsicle stick. We used the colors, red, blue, yellow, orange, green, and purple. Next, I wrote out the color word on a clothespin-- one clothespin per letter. Yes! That was a lot of clothespins! In keeping with the color theme, I wrote the letters in the color they were to be clipped on. 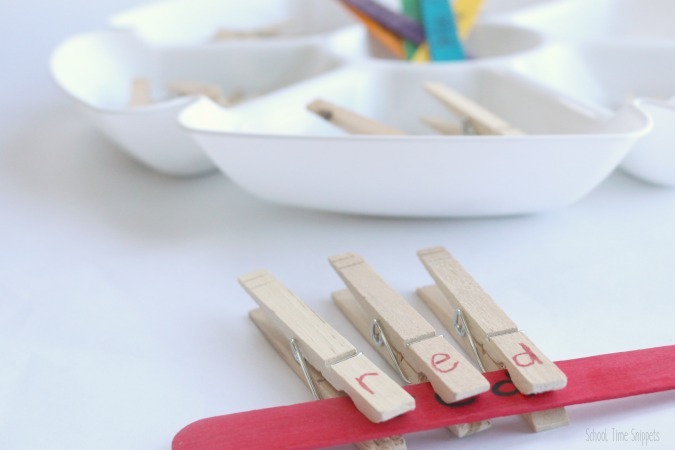 Thus, the clothespins that spelled "red" were written in red marker, and so on. 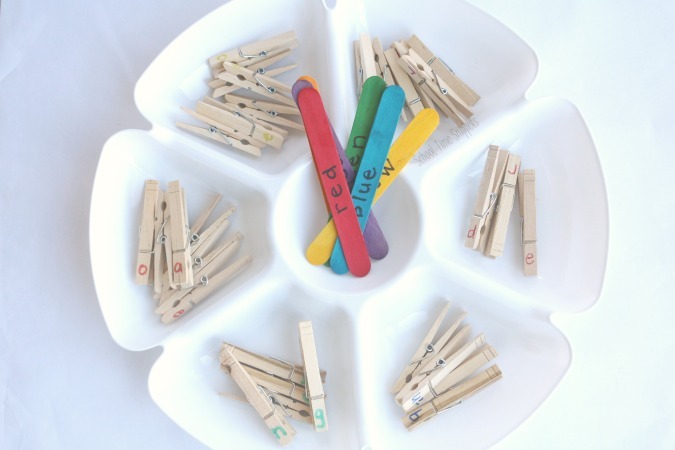 I had a large enough tray so that each group of clothespins had their own section. I mixed up all the letters and put the colored popsicle sticks in the middle. The object of the activity is to have your child clip the letters in the correct letter on the popsicle stick. 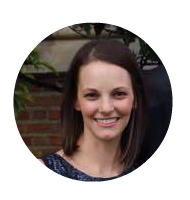 Your child will get a lot of practice with letter recognition and become familiar with the correct spelling for each color word. 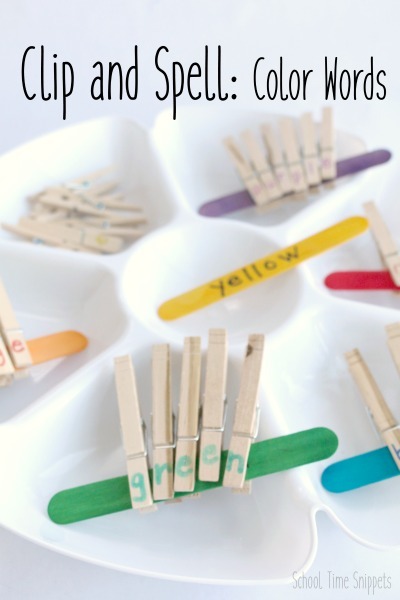 Have your child continue working on fine motor skills as he/she clips the clothespin letter on each popsicle stick. 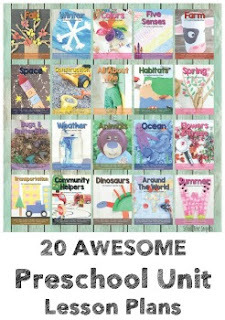 If you are a fan of clothespin activities as well, try one of these 12 ideas to Boost Fine Motor Skills!! Clip and Spell Color Words is a great way to make spelling fun-- and is great for those that aren't into writing yet. All the while STILL building fine motor skills. With this simple spelling activity, your child will begin to recognize the colors of all the words of the rainbow!